Sport Kote® PC is the next generation of Sport Kote, the market leading water-based single-component gym finish for the last 15 years. What’s different about Sport Kote PC? Everything…and nothing. 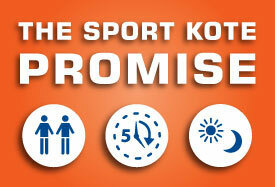 Sport Kote PC still delivers our Sport Kote promise, low VOC’s and is MFMA-approved and UL-classified. But…now it’s made with Polycarbonate, the same material found in the bullet proof canopy of the U.S. Military’s new F-22 Raptor fighter jets. That means big gains in durability, gloss and scuff/scratch resistance for gyms that take a beating year in and year out. Sport Kote PC is part of the Sport Kote System. WARNING: Reproductive Harm – www.P65Warnings.ca.gov. Incorporates revolutionary polycarbonate technology, offering increased depth, extended gloss and extreme durability. PREPARE FLOOR: This finish is not designed for application to bare wood floors. Use only on previously sealed surfaces. Use only after proper training. SCRUB AND RECOAT: Dust mop floor and remove all chewing gum and labels. Prepare floor with Sport Prep (00425SF), following the label directions. NOTE: Test previously coated floor in an inconspicuous area before recoating to determine compatibility with existing finish. Apply no more than 2 coats in 24 hours and a maximum of 3 coats in 48 hours. See finish application instructions below. APPLY FINISH: Stir gently before using. 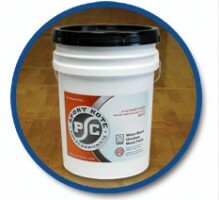 Apply at a rate of 800-1000 square feet per gallon. Use a weighted T-bar with a clean, synthetic pad. Apply thin, even coats with the grain of the wood while walking at a slow, even pace. Walking too fast may produce excessive bubbling in the finish. Allow a dry time of at least 1 hour between coats. Humid conditions require longer dry time. After the first coat has dried, apply a second coat. It may be necessary to screen the first coat if grain raising has occurred or it has dried longer than 4 hours. If so, screen the floor with a previously used 120 grit screen or maroon pad. Always vacuum and tack thoroughly after screening. NOTE: Check expiration date. Contact Essential for batch re-certification if expiration date is exceeded. Do not pour unused finish back into original container. MAINTAIN DAILY: Dust mop at least daily, or more as required, to keep floor dust and dirt free. Damp mop spills, salt residue, etc. with Sport Clean (01143SF) and a thoroughly wrung mop. MAINTAIN WEEKLY: If soil conditions are heavy, auto-scrub weekly with red pads and a 2 ounce per gallon dilution of Sport Clean (01143SF). 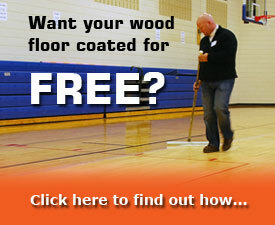 Refer to the Wood Floor Care Wall Chart or Manual for further details. CAUTION: Do not use cleaning compounds other than Essential’s Sport Clean (01143SF) as they will reduce product performance and longevity. RESTORATION: Dust mop floor. Follow restoration directions for Sport Prep (00425SF). ** See label directions and MSDS for complete usage and safety instructions. Weight per Gallon – 8.51 Lbs. * Properties are typical and subject to usual manufacturing tolerances.